Selling online successfully is all about presentation and creating an atmosphere of confidence and trust. 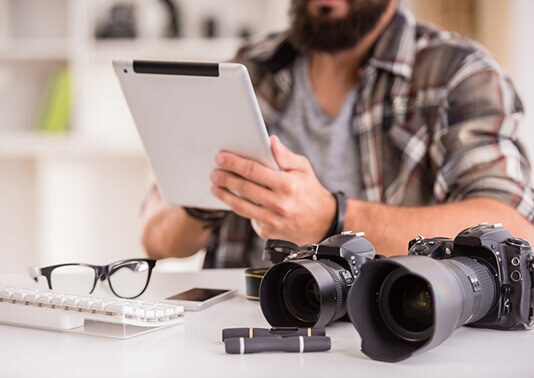 In this newsletter, we share ways you can improve the presentation of your products using professional-quality photography tips. Great product photos may stimulate your online sales and lower returns. As online shopping continues to grow market share, the sense of touch has been removed from the buying process, making visual appeal more important than ever. According to ecommerce consultant BigCommerce, two-thirds of consumers rate image quality as "very important" when it comes to online purchases. Before you rush out and hire a pricey photographer, check out these great tips for cost-effective and professional-looking DIY photos. Don't let anyone talk you into dropping hundreds or thousands of dollars on a state-of-the-art camera. If you can afford it, then by all means, but modestly priced cameras and even smart phones are capable of producing high-quality photos. Decisions such as lighting, staging and processing play a more significant role. • Set up a table as close to a window as possible without getting into the shadow cast by the windowsill. • Use poster board or mats to create a generic white background, "sweeping" it from the horizontal tabletop to the vertical wall to provide a seamless look. • You'll need at least two lights. Clamp-style is preferable as they stay in place but can be easily moved around. Make sure to use identical light bulbs with a cooler shade. In many cases the white background will be sufficient, but some products have more appeal when shown in use. For instance, a picture of a person wearing sunglasses can be more attractive to potential customers. Take a number of pictures of your product from a variety of sides and angles. Multiple views are the best way to overcome the two-dimensional aspect of online images. For best results you should shoot in RAW format, which captures all of the visual data and gives you greater latitude in editing. In addition, changes don't affect the original file so you won't have to worry about losing data. After every session, review your work with a critical eye to see what worked and what didn't, and then apply your findings to future photo shoots. Are inventory, order processing and logistics taking valuable time away from the business of driving sales? Contact Medallion Fulfillment & Logistics to learn more about our comprehensive ecommerce fulfillment services. With Medallion Fulfillment & Logistics, you can outsource the warehousing, reordering, order processing, and shipping of your apparel and clothing SKU's. Located in close proximity to the Port of Los Angeles in California, we are the perfect national or west coast fulfillment resource for your outsourcing needs. Our procedure of closely monitoring shipments 24/7 alerted us to the problem while there was still a chance to fix it. Read the full story now.